Sadly, I only discovered buffalo chicken a few years ago. It was one of those “OMG where have you been all my life?” moments and I’ve been obsessed with it ever since. And since that time, I have tried a lot of buffalo chicken recipes, including many that were far from healthy and low-fat. 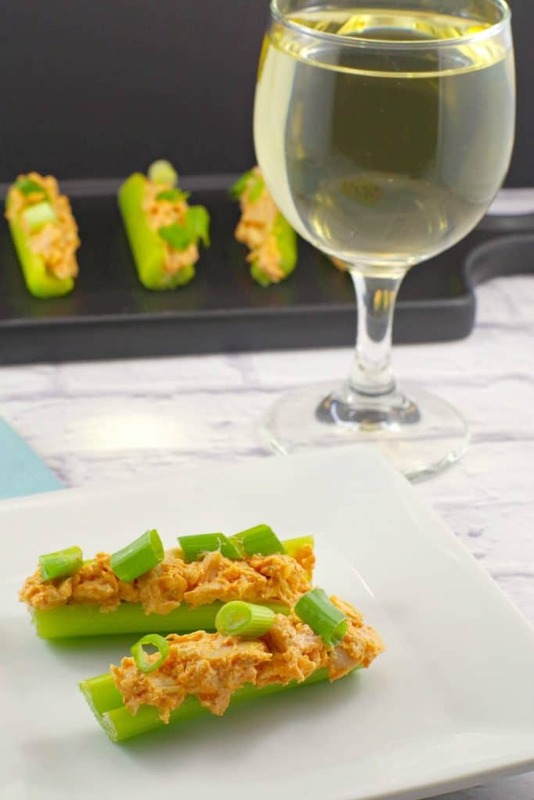 But that all changed when I added my shredded buffalo chicken mixture to celery sticks and this Skinny Buffalo Chicken Celery Sticks weight watchers appetizer was born! Have you ever found yourself at a social gathering, desperately scanning the spread of food for something that’s even vaguely healthy (that won’t blow the entire WW points bank)? And if you’re the least bit lucky, you may find a tray of veggies and dip, in amongst all the fattening, unhealthy stuff. BORING! Although I’ve always been a celery fan (especially dipped in veggie dip), I was never a big fan of ‘ants on a log’ (that peanut butter and raisin celery thing), or celery with Cheez Whiz, which seemed to be the only 2 other options around (besides dip), for the majority of my life. But this buffalo chicken mix elevates celery to entirely new level of deliciousness! I only wish I discovered it years ago. This recipe uses leftover rotisserie chicken, which saves you hassle and time! Leftover rotisserie chicken recipes are the best, especially when they involve buffalo chicken. And it’s actually such a hassle to cook up chicken or chicken breasts that I’ll even buy a rotisserie chicken just for this recipe. Then I end up with chicken leftovers for sandwiches or for these delicious WW friendly Easy Chicken Quesadillas (which also make a great game day snack)! 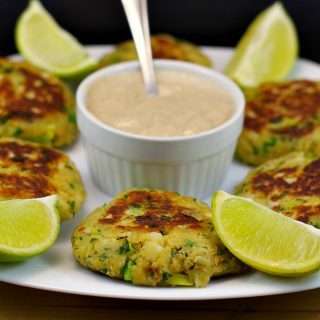 So, if you are looking for quick and satisfying weight watchers appetizers, then give this a try! You may also want to try my Weight Watchers Friendly Tortilla Pinwheels, which you can also make with leftover rotisserie chicken. Why not bring them to the party yourself, then you know you’ll be guaranteed something delicious and WW friendly! Cut rotisserie chicken into very small pieces/shred. Mix chicken, cream cheese, worcestershire sauce, garlic and buffalo sauce together. 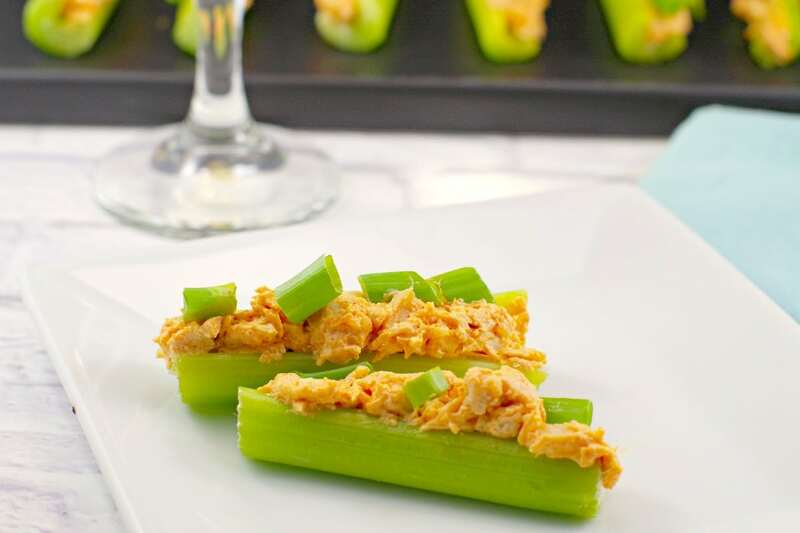 Cut celery into 2-3 inch pieces and fill with buffalo chicken mixture, dividing evenly between all celery pieces. Terri, this is a great idea for leftover chicken! I’m loving this low-carb idea. Pinned! As a kid, I loved celery with cheese wiz. Now there’s no way I would eat cheese wiz, but I do remember that it was good! 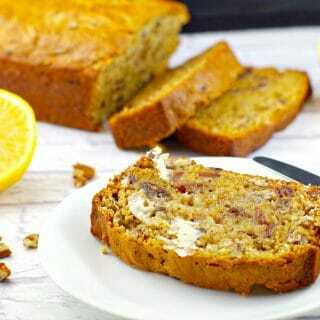 This recipe looks so delicious, and super simple, too. Can’t wait to try it! Thank you, Denise!Yes, my kids love it! 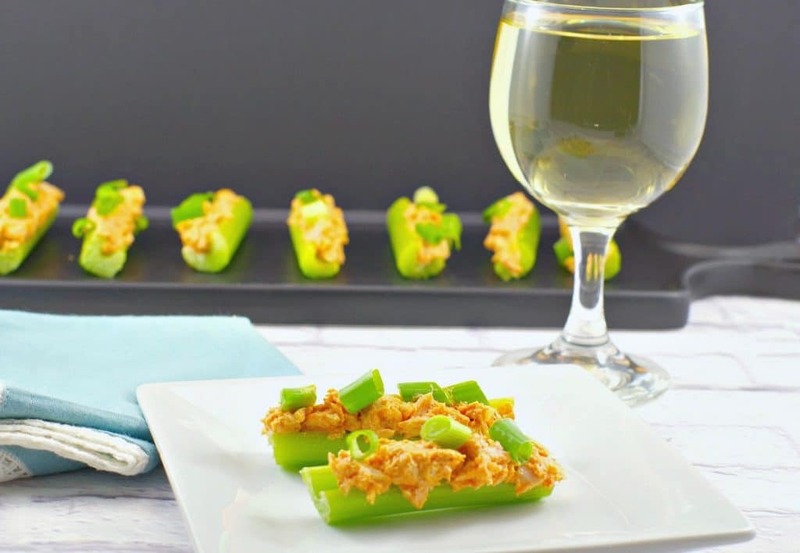 I love this healthier take on a buffalo chicken appetizer! Anything buffalo chicken and I want it bad! These would make perfect snacks for while I watch Netflix this weekend. Thanks, Vanessa! Yeah, I totally love to munch on them while watching Netflix!